Life has changed drastically compared to what it was two decades ago, especially here in India. Technology advancements, globalization, fast food culture, courtesy some international and local franchisees… life has become easier yet complicated with many health problems – obesity being one concern. Weight loss is the key. While talking about women, obesity is not necessarily related to food habits. Women have to go through a different set of problems compared to the men, that leads to obesity or weight gain - hormonal changes due to puberty, child birth, stress, health complications and many more reasons. Countering these problems with some food restrictions and exercise will not really help if it’s not maintained properly. Besides, it is easy to fall prey to fad diets which last for a couple of weeks or months. Once that’s over, be prepared to say hello to the extra pounds mounting over your body once again. But if you are really serious about healthy weight loss, prepare yourself mentally first! Take your time to accept the challenge of a slow process of weight loss – a time frame of at least 6 months to a year. In fact, this time frame will prove beneficial in the long run helping you maintain a diet that will promote weight loss and keep you healthy. If this goal seems distant, remember the Hare and Tortoise tale. It had a very powerful message – Slow and Steady Wins the Race! After dealing with the first mental block, it’s time to organize your diet. But while thinking about food, temptations are bound to occur. No matter, how hard one tries, there’s always a tendency to binge into unhealthy snacks like burgers, pastries, cookies or our very favorite street foods like gol gappas, chaats and pakodas. Don’t worry if you have such cravings. Pamper yourself with such treats once a fortnight or month as a bonus for sticking to your largely healthy diet. But don’t overdo it by hogging away to your heart’s content. Follow the KISS principal – Keep it Small and Sufficient and put Nutrishake into your daily health and wellness routine. Now that you are convinced that your weight loss diet is not going to be as challenging as those prescribed by dietitians or doctors, let’s get to the main crux of the subject – the good food guide. Many dietitians would recommend having small meals between an interval of two to four hours instead of three large meals at breakfast, lunch and dinner. I too would vouch for the same. In fact, your Breakfast must be King-size, Lunch like that of a Prince and Dinner like a pauper – really light. But that doesn’t mean you cannot snack in between! Start your day with a healthy mix of Oriflame Nutrishake with fruits or cereals like oats or cornflakes. The nutrition through fruits can best be acquired when eaten whole, but opting for a home-made fruit juice would also serve the purpose partially. Try your best to avoid packaged fruit juices as they contain preservatives that are not really as healthy as they claim. Milk is another rich food that can boost your health and satisfy your hunger pangs. While non-vegetarians can bite into eggs for their protein needs, vegetarians can sip on Oriflame protein shake to build their body. Oriflame Nutrishake is a good protein drink option that’s available in three tempting flavors of Vanilla, Strawberry and Mango-Banana. Complement your breakfast or work-out routine with this health-drink that will keep you satisfied and nourished. You can savour this drink in between meals too – after all it is a healthier choice! Balance your lunch with healthy salads, carbohydrate sources like rice or wheat, pulses and vegetables. And if you prefer a two or three course meal, begin with a healthy soup like Oriflame Nutrisoup. This soup is packed with the goodness of health that promotes weight loss! A perfect substitute for dinner, it doesn’t harm adding an extra serving at lunch as well. Munching on fruits, nuts or a glass of Oriflame Nutrishake will help control your growling tummy at tea time. Like the soup, this protein shake too promotes weight loss as I’ve described in my earlier posts on Oriflame Nutrishake. So, go ahead, enjoy health benefits while tickling your taste buds! Talk to us to find out what will work best for you. Mrs Jashmi Waghela has helped many people in reaching their weight loss goals. 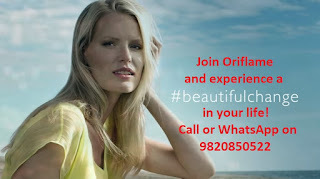 Consultation is free and when you order Oriflame Wellness Products from us you can get a good deal from us. You can also become a member of Oriflame get all these products at a good discount.